This page contains answers to common questions asked during beta testing, along with some tips and tricks that we have found useful and presented here as questions. The macros aren’t working and I didn’t see the splash screen. Why do the productivities and total costs change when I import my data into a clean model? When importing a previous model I receive a not a valid model file error message. How do I load cost data into the SRCE model? I get an error message telling me that the cost data file I am trying to load is not valid. Where can I find standardized data for my area? What do the different colored cells mean? How accurate is the SRCE model? How does the SRCE model determine the number of trucks or loaders needed? How was the SRCE model tested? Why are the numbers slightly different when I check the model with a calculator? Why are the areas calculated in the model slightly larger than what I measure on a map? Is there a method for estimating the cost of pit backfill? See the Security Tip for instructions on setting and editing security settings to allow the Model to run in Excel. If you still have issues, you may need to override some of the macro security in Excel. This may be against your corporate IT policies, so be careful. In the Fleets/Crews sheet, check all of the fleet settings to make sure they were imported properly from the original model. If not, manually set them to the correct settings. This might require changing the fleets to different equipment and then resetting them to the correct equipment. 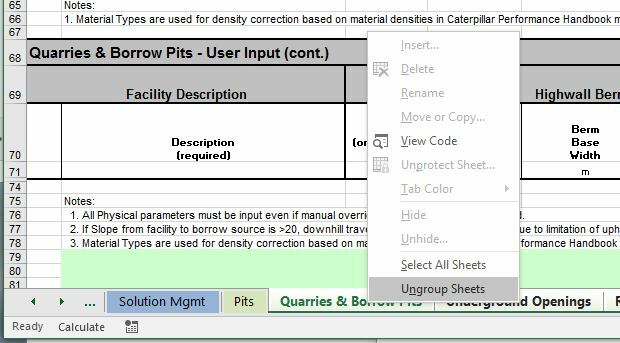 In the Productivity sheet check the job and operator correction factors at the top of the sheet to make sure they are the same in both models. If your original model included adjustments to the Altitude Deration table at the bottom of the Productivity sheet, you will need to make these adjustments manually to the new model. When importing a previous model I receive a message that says the it is not a valid model file. What is the problem? 1) The file you are trying to import is not a SRCE model. 2) You are trying to load a new version of the SRCE into an older model version. 4) Some of the worksheets in the model you are trying to import are grouped. Follow the instructions below if you don’t know how to ungroup worksheets. If any of worksheets in the file to be imported were grouped when the file was last opened (e.g. for printing multiple sheets), the file may have been saved them with them grouped. If so, the import routine cannot import the file into a new model. You will have to ungroup the worksheets and save the file again before it can be imported. You can tell if the worksheets are grouped by looking at the worksheet tabs at the bottom of the screen. If any of them are grouped, they will be a lighter color than ungrouped ones. To ungroup the worksheets, select the tab of one of the grouped worksheets and click the right mouse button. Select Ungroup on the menu that appears. What is the security warning message that comes up when I load the model? When you load the model for the first time, you should see a security warning at the top of the Excel window. If you click on the link that says Macros have been disabled, the Security Warning dialog box will appear. Click on Enable Content. Select Advanced Options. This will open a Security Options dialog box. This lets you know that the file contains macros and give you the option to verify that the code comes from a publisher with a valid code signing certificate from a registered with an online security service (e.g. Symantec). You should see the description a digital (VBA Code Signing) certificate from SRK Consulting US Inc.
A code signing certificate is verified digital signature that ensures that any code (programs) or macros are published by a person or company registered with an internet code certifying organization. 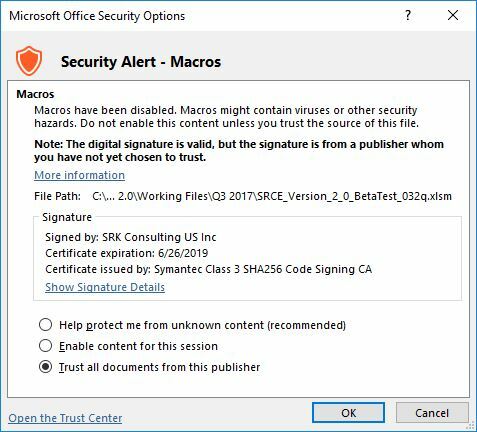 The VBA code and macros within SRCE have been written and signed using this type of signature to protect users from forged versions that could contain malicious software code. This dialog box gives you the option to review the certificate and then enable the macros contained in the SRCE. You must do this for the model to work properly. You can avoid having to accept the code signature each time you open the program by selecting Trust all documents from this publisher. Cost data is imported into the SRCE model using the “Import Cost Data” option from the custom SRCE Menu. If the cost data file changes, you will need to re-load the cost data to update the model. The data must be in the exact format contained in the user cost data file (Cost Data USR.xls) file available from the Downloads page of this web site or a standardized cost data file available from your local regulatory agency. Links to some of these regulatory web sites are also listed on the Downloads page of this web site. The standardized versions of the cost data file are locked and cannot be edited by the user. These files are typically maintained and updated by regulatory agencies responsible for reviewing and approving reclamation cost estimates for financial surety purposes. The cost data cells in the user cost data file are unlocked to allow users to enter their own cost data (e.g. mine costs). This error message appears when you try to import a cost data file that is not in the correct format. Because of changes that may occur from one Model version to the next, the format of the cost data files may also change. For use with Version 1.4 you need to use Version 1.12 of the cost data file For a user editable version 1.4 cost data file (SRCE_Cost_data-USR_1_12.xlsm), go to the Downloads page on this website . The standardized Nevada cost data file (cost_data-std-nv201?.xls) used with the Nevada Version (1.4 Build 17) can be downloaded at the NDEP website. For SRCE 2.0 you will need a 2.0 data file (SRCE_Cost_data-USR_v2.0 (for SRCE 2.0) available on the Downloads page of this website. 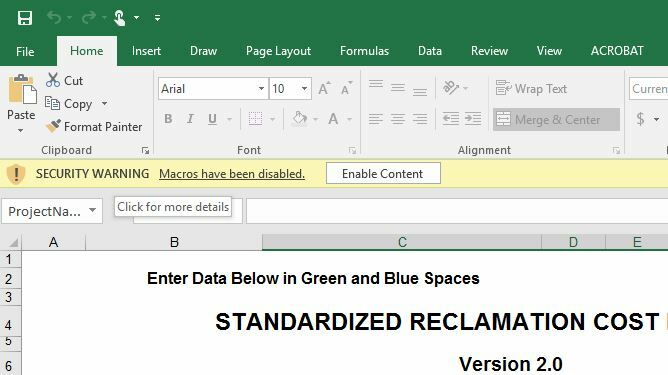 Typically, if the regulatory agency responsible for reviewing and approving reclamation cost estimates for financial surety purposes in your area has adopted the Nevada SRCE as an acceptable reclamation cost estimating method for your area, they should have an area-specific version of the standardized cost data file available on their web site. We will attempt to keep an up-to-date list of links to regulatory agency websites that contain standardized data files, but contact your regulatory agency if you do not find a link for your area on the Downloads page of this web site. If an agency requests that a copy of the file be stored on this site you will be able to find it on the Downloads page of this web site. If your local regulatory agency has not created a standardized data file, you can use the user cost data file [SRCE_Cost_data-USR_1_12.xlsm or SRCE_Cost_data-USR_v2.0 (for SRCE 2.0)] file available from the Downloads page of this web site to input your own cost data into the model. Cells formatted for user input are colored green, cyan and yellow. All other cells are locked and cannot be accessed by the user. The only exception to this are the User sheets, which are unlocked to allow user input and formatting to all cells except the headers. Green cells are formatted for direct input. Cyan cells contain drop-down lists that allow the user to select from a list of valid options. Yellow cells are used for direct user input that overrides calculated values for earthwork volumes or areas (i.e. regrade volumes or areas for revegetation). Where appro priate, data entry tips are provided when a cell is selected. The data input by the user. To the degree possible, we have attempted to provide references, figures and footnotes in the model to describe the assumptions and methods used in the calculations. A technical reference manual that will further detail the methods is in production. The input provided by the user will have a significant effect on the accuracy of any reclamation cost estimate generated by the model. The basic philosophy used in developing the model assumed that the user would have a basic working knowledge of reclamation cost estimation techniques along with an accurate description of the facilities, a good topographic map of the project and an engineering scale. The user should be able to generate all of the required input using these items. Other methods including CAD, GIS, and engineering software can also be used to prepare the user input data. The number of scrapers or trucks required to efficiently move cover material or topsoil is calculated based on the time required to fill each truck/scraper and the cycle time for each truck/scraper (i.e. time required for each truck or scraper to make a round trip to/from the borrow source to the facility to be covered). The number of trucks or scrapers is then optimized based on the the time required to load each truck/scraper, a method referred to as loader-limited or dozer-limited. In other words, the model assumes that there will always be a truck/scraper ready to be loaded as soon as the previous one is loaded. Testing of the model was performed first by the primary developers using hypothetical and actual data from real mine sites (alpha testing). Model results using real mine sites were compared to other methods. After initial testing, beta test versions of the original were distributed to state and regulatory agencies, mine operators, and the public for further testing. Throughout the alpha and beta testing processes, comments were compiled and, as necessary, changes were made to the next version of the model. Version 1.0 represented the first official public release of the model and was, in effect, the first field trial of the model. Subsequent updates to the model including Version 1.4 Build 16 and Version 1.4 Build 17 (Nevada version) were tested by beta testers and the updates to the Nevada version was approved by the SRCE Working Group before updates were released. The development of SRCE 2.0 was a significant effort that took several years. Throughout this process a select group of experienced SRCE users and mine closure specialists were consulted to validate the assumptions used in the model. A group of expert users tested alpha versions and provided input to the model. When the first beta test versions were available, a beta test group was assembled. This group conducted testing on beta test versions for approximately four months. The current release of SRCE 2.0, is a public beta release. We released this version as a beta, as we did Version 1.0 in 2006 because, while it would be nice to think that we have found most of the bugs and thought of most of the features that the model should include, we are more realistic that that. Our experience has shown that despite the best efforts of the beta test team, users in the real world will attempt to do things with the model that were not contemplated during testing. This is likely to uncover the need for changes and additional features. Basically, we assume that this model will always be a work in progress. The simple answer is rounding. The Nevada SRCE Working Group defined the criteria for rounding of numbers in the model. This option in Microsoft Excel is implemented by using the Round function [Round(number, n) where n = the number of decimal places]. All calculations in the model are performed using the default rounding (none) until a final number is calculated. When the total hours required to haul and place cover are calculated, the initial calculations (cycle times, maneuvering times, etc.) are performed using no rounding. When these interim calculations are used to calculate the final number of hours is calculated, the number of hours is rounded to one decimal point. When the number of hours is then used to calculate the labor and equipment costs, the final cost calculation is rounded to the nearest unit (e.g. dollar). The model needs to determine surface area (i.e. the area of the non-planar surface) of a facility to accurately estimate cover and revegetation areas. A map area (or footprint area) is the horizontal projection of a facility. Therefore, if a facility has sloped areas (e.g. a waste rock dump), the actual surface area will be slightly larger than the horizontal projection, or map area of a facility. The amount of the difference is determined by the angle of the sloped portion. The greater the slope angle, the larger the difference. In the waste rock dump and heap leach modules, the model asks for a final footprint area in the user input because it uses that information along with the horizontal projection (footprint) of the slope area to determine the amount of flat area in the final configuration. 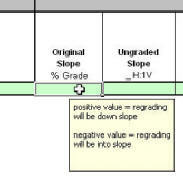 The footprint of the slope area is not displayed anywhere in the output. Mot directly. 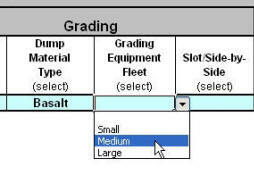 However, you can use the Haul Material sheet to estimate the cost of hauling backfill to a pit. 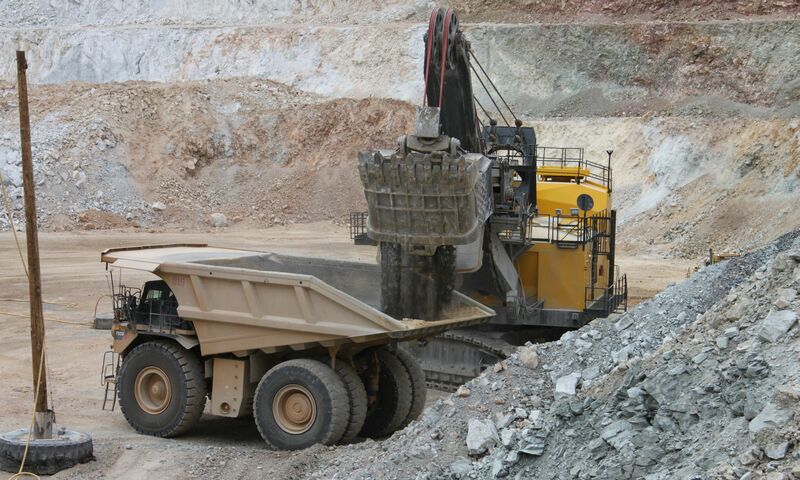 Because the costs estimated in this worksheet are based on hauling material from one location to another using the same algorithms as the other material hauling functions in the model, using this for hauled backfill should give reasonably accurate costs. If a pit will be partially backfilled by regrading the pit walls, you can use the Quarries & Borrow Pits worksheet.